1080i - HDTV image; 1,080 vertical lines by 1,920 horizontal pixels wide, displayed in interlaced format. 480i - SDTV image; 480 lines by 720 pixels wide, displayed in interlaced format. 480p - HDTV image 480 vertical lines by 720 horizontal pixels displayed in progressive format. 720p - HDTV image; 720 vertical lines by 1,280 horizontal pixels wide, displayed in progressive format. ATSC - Advanced Television Systems Committee: A committee established by the FCC to define new standards for publicly regulated broadcast television in the U.S.
AC97 - Audio Codec '97: This is a standardized set of features and system controller interconnect for sound chips. The most current version 2.3 specifies the ability for audio chips detect how the analog ports are being used and reconfigure accordingly. Version 2.2 added the most important feature for HTPC use: S/PDIF output. This has also become a colloquial way to identify soft-audio chips from fully accelerated audio processors. Traditionally the on-board audio of motherboards has been basic (cheap) soft-audio which harnesses the AC97 link in the system's southbridge to provide a CPU assisted sound interface. The chip merely provides the front-end interfaces: It provides a basic Digital to Analog Converter (DAC) for the outputs, an Analog to Digital Converter (ADC) for the inputs, as well as a S/PDIF compatible interface for direct digital output. Codec - Compressor/Decompressor: this is the technology to execute an algorithm to compress or decompress video or audio. Component Video - This type of connection takes the native components of display ie: Red, Green & Blue (RGB)and separates them onto individual wires in the form of Y/Pb/Pr. This uses the luminance (Y). The difference between the luminance and the blue channel (Pb) and, likewise, the the difference between the luminance and the red channel (Pr) then combined with (Y) you get a very clear mathmatically obtained Red and Blue signal. Then the sum of R and B are subtracted from Y to obtain Green. Click here to see a picture of a component cable. To see what a component connector looks like on the back of a TV click here. Composite Video - A single video signal that contains luminance, color, and synchronization information. This is the oldest way to hook up a television. For a picture of a composite cable click here. 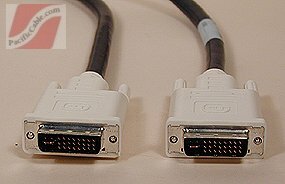 To see what a composite connector looks like on the back of a TV click here. DivX - This was originally a hack on the Microsoft MPEG4 codec, its' sucess lead to a total overhaul (ie: DivX version 4) to be a legal and fully MPEG4 compliant product. DSS - Digital satellite service: MPEG-2-based digital transmission format, commonly known for being used by DirecTV. DVB - Digital video broadcast: MPEG-2-based digital television standard that defines formats for cable, satellite, and terrestrial broadcast. DVD - Digital Versatile (or Video) Disc: A newer relative of the Compact Disc, can hold 4.7GBs or more, it is commonly used for storing video in MPEG2 format with an Dolby Digital sound track. DVI - Digital visual interface: Digital connection between a video source and a monitor, often used for connetions between HDTV components as well. A picture of a DVI cable can be seen here. To see what a DVI connector looks like on the back of a TV click here. DxVA - DirectX Video Acceleration: DxVA is a standardized group of MPEG2 decoding video routines that are to be in a modern graphics processor's video engine. This allows modern video cards to accelerate the most CPU intensive parts of the MPEG2 decoding process, leaving the lesser parts of the decoding pipeline to the CPU. This can also simply be called Hardware Acceleration. For HDTV use DxVA accleration becomes critical as pure software decoding of HDTV streams requires a 3Ghz processor while only a ~2Ghz processor is needed with a DxVA compliant video card. Video cards that are DxVA compliant include the ATI Radeon family, the GeForce 4 MX and GeForce FX family. EDTV - Enhanced Definition Television: This is a step up from SDTV, it is 480/576 TV in progressive scan and typically widescreen (ie: 852x480). EPG - Electronic Program Guide: an interactive TV listing. You can choose what you want to watch by selecting it from the listing. In a PVR application it will also give you the option to record it. Front End - Software used to navigate and manage different components in an HTPC. Usually easily viewable on a television screen and with support for remote controls. These may be available commercially, as freeware or as open source software. "HD Ready" - Also called "HD-Compatible". This is marketing jargon, typically all it means is that a TV set or LCD/Plasma monitor it ready to accept an HDTV signal. This is typically via a Component connection it is also possible that is may be via DVI or VGA. Just because a display can accept HDTV signals does not necessarily mean it will display full HDTV resolution. For exmaple there are many EDTV Plasma monitors that are inexpensive and while they will accept a 1080i signal they will downsample it to fit onto an 852x480 display. HDCP - High-bandwidth Digital Copy Protection: a standard of content protection that encrypts each pixel as it moves from a PC or set-top box to digital displays. It can be used with an HDMI or Firewire interface for connecting digital A/V components. Currently HDCP is not a factor with PC to HDTV connections but may be in 2005 and later. HDMI - High-Definition Multimedia Interface: this is a new standard for an uncompressed, all-digital audio/video interface. It is related to the DVI standard and is backwards compatible with it. HDMI can support all known SDTV, EDTV, and HDTV video standards, plus 8-channels of digital audio on a single cable. HDMI also supports HDCP for content protection. For a TV to PC interface HDMI is used in its backwards compatible state with a DVI adapter. Also see HDCP. To see what the new HDMI connector looks like next to a DVI connector see here. HDTV - High-definition television: High-definition video formats that have 16:9 aspect ratio. Generally refers to 1080i or 720p images. HTPC - Home Theater Personal Computer: A computer designed to be used as a media center for digital home entertainment such as Movies, Music, Television, Games, Etc. IEEE1394 - The standard for a digital connection or bus used to transfer data between two independent systems. The 1394a standard provides 400-Mbps bandwidth but the reach is limited to 3 or 4 meters. The 1394b standard extends the bandwidth to 800 Mbps. Apple, who developed the standard, has a copyrighted name for 1394, they call it "Firewire". Likewise, Sony calls their 1394 interfaces "iLink". Interlaced - A scanning technique in a video system where odd and even horizontal scan lines of a video frame are displayed during alternating update cycles. IR Blaster - A device that learns IR codes from your existing set-top box or other HT equipment's remote and then sends (or "blasts") these codes when instructed. This is most commonly used to control a satellite or cable box to change channels for recording. Macrovision - A copy-protection scheme that inhibits illegal copying of analog television programs. This also currently limites DVD playback at 480p. MPEG - Moving Picture Experts Group: a set of digital video standards set by the MPEG committee, for more on all three common types of MPEG see this excellent write-up at Webopidia. NTSC - National Television System Committee: The committee that defined the color television system for the US that we know today. Other variations of NTSC are used in Canada, Japan, Mexico, Taiwan and other countries around the world that use a 60hz power cycle. Its' native resolution is 720x480. PAL- Phase-alternating line: The analog color video composite system developed in Europe and used by countries around the world. It is similar to the NTSC standard, but it uses a sub-carrier phase alternation technique that makes certain kinds of transmission errors appear to cancel. Its' native resolution is 720x576. Progressive Scan - A picture-scanning process where all the lines of the image are scanned by every vertical scan. PVR - Personal Video Recorder: A digital recorder that uses a hard drive to store compressed video (typically MPEG2). These devices typically also have advanced program scheduling and timeshitfing abilities. This is also known as a DVR - Digital Video Recorder. The most commonly known PVRs are TiVo and ReplayTV. RGBHV - This is another way to describe VGA. It consists of Red, Green, Blue, Horizontal sync, and Vertical sync. When refered to in this manner it often means it is broken out into 5 connectors rather than the VGA DB-15 connector. See a picture of a VGA to an RGBHV breakout adapter with BNC style connectors here. To see what an RGBHV with BNC connectors looks like on the back of a TV click here. S/PDIF - Sony/Philips Digital Interface: is a standard form of audio transport, S/PDIF allows the transfer of audio from the source to another piece of equipment while preserving the full quality of the audio signal. The alternative, transmitting analog and then converting back to digital at the receiver, could degrade signal quality. Typically sound out the S/PDIF for anything that is not pre-encoded in AC3/DTS will not be 5.1: any other type of audio will be 2 channel stereo. The one exception to this is the nVidia Audio Processing Unit; found on nForce1/2 motherboards with the MCP-D/MCP-T "southbridge", this audio processor has the unique ability to encode any Windows sounds (including the positional/EAX audio in games) into a positional Dolby Digital 5.1 stream so that a PC can be connected to a surround sound receiver digitally via S/PDIF and not have non-DVD audio sources fall back to Stereo mode, this has the added benefit of only one cable is needed rather than 6 RCA cables. SDTV - Standard definition television: Standard definition video format (AKA 480i or 576i). This would be plain old TV. STB - Set-Top Box: this refers to digital boxes that interface with a television most often associated with digital satellite or digital cable receivers. S-Video - This is a newer and better connection standard than composite video, it has separated luminance (black level) and color signal forms (ie: Y/C). It has two channels of information, the black and white (technically luminance) on one and the color on the other. To see what an S-Video cable looks like click here. To see what an RGBHV with BNC connectors looks like on the back of a TV click here. SVCD - Super Video CD this was an enhanced version of the VCD format that uses constant or variable bitrate MPEG2 at 480x480 for NTSC or 480x576 for PAL. As with VCD this is much more popular in Asia thean Europe or the Americas. SVCD's quality is roughly like a good VHS recording, and often even comparable to a Laserdisc. Also see VCD. Timeshifting - the ability to record, rewind, and pause a digital stream of TV. When a person pauses the TV, the computer continues to record television so that when a person un-pauses they can resume watching television right where they first paused the TV, it is as if they could alter or shift time. Made popular by TiVo. signal needed for most HDTV sets. TV Tuner - (AKA TV Capture Card): A hardware device that may be internal or external to a PC that is used to capture Television signals either from an antenna, satellite feed, cable feed or from an intermediary source such as a cable box or satellite receiver. VCD - Video Compact Disc: This was a precurser of sorts to the DVD. It is not widely used in North America but very common in Asia. The standard was formed in 1993 by a consortium of Japanese electronics manufacturers. It uses constant bitrate MPEG1 video data a 352x240 for NTSC and 352x288 for PAL with stereo MPEG audio. Its quality is rougly equivallent to a VHS recording done on long play or super long play. VMR - Video Mixing Renderer: this comes in two major "flavors" VMR7 and VMR9. VMR7 (initally simply called "VMR") was an initial trial, so to speak, of newer advanced video mixing abilities using the 3D pipeline and the DirectX Video Acceleration API, it was only available in Windows XP. VMR9 is a newer, some what different, and improved VMR that comes with DirectX 9 therefore it can work on any system that can install DirectX 9, but VMR9 has more strenuous hardware requirements than VMR7 (VMR7, as you can guess, is VMR using DirectX 7/8 level technology.) For VMR7 You need a DirectX 8.1 compliant card to utilize VMR7's deinterlacing and filtering. For VMR9 you need DX9 installed and recent DX9 compliant drivers for your video card installed. A fully DirectX 9 compliant video card (GeForce FX family or Radeon 9500+) is recommended so that all VMR9 features (specifically, the newer DX9 deinterlacing and filtering) can be utilized; for basic VMR9 support DirectX 8.1 level cards will do fine and some DX7 level cards may work providing they meet some requirements. WAF - Wife Acceptance Factor: This rather sexist term (as this is a primarily male hobby) refers to the overall ease of using something and whether the non-technical members of your family will actually want to use it. More approriate versions could be FAF: Family Acceptance Facctor, FFA: Full Family Approval, SOA: Significant Other Approval, or NGAF: non-geek acceptance factor. XviD - An open source alternative to DivX that has arguably better video quality.